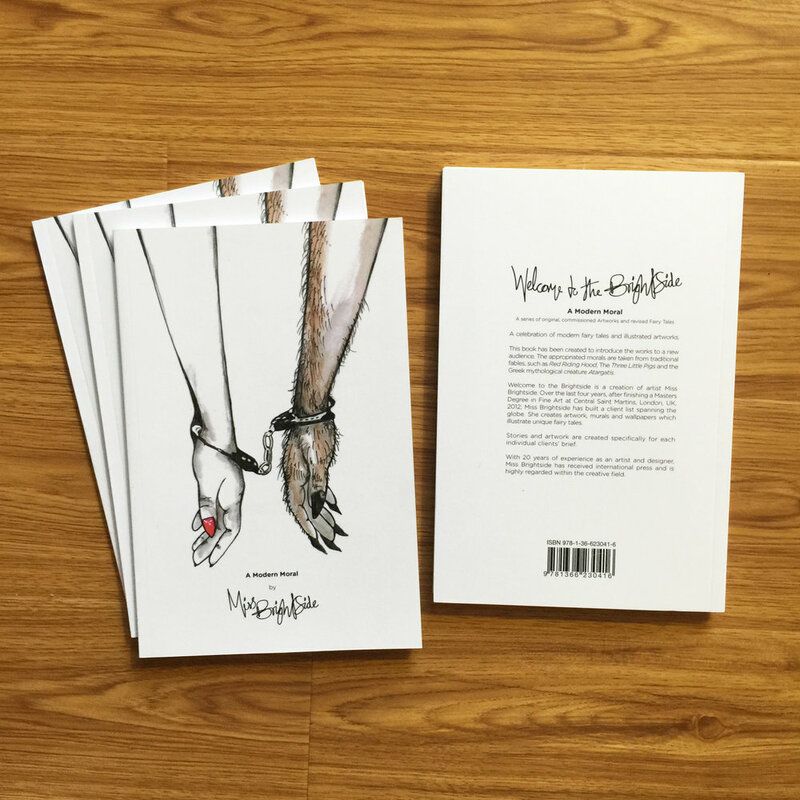 This book is the creation of Miss Brightside, the concept of which is to take a selection of her artwork and moralistic stories and introduce them to a wider audience. The original artworks are site-specific, exhibiting across the globe in art galleries, hotels and powderooms. The book endeavours to investigate how the large-scale artworks and fairy tales can be observed back in their traditional format. The artworks and stories are conceived in conjunction with a working client brief and appropriated classic fable. The modern moral is applied to the story and is either taken from a traditional fable or a famous spiritual quote. Miss Brightside, states, ‘I use storytelling, in particular fairy tales, to narrate the artwork. Thus, the story is as important as the art. My artistic intent is for the viewer to listen to or read the narration of the fairy tale, whilst observing the artwork.This is to physically draw the viewer into the work, installation and the fantasy world, which I recreate.’ After every illustrated story in the book, more information can be found on how each commission evolved. All Brightsides’ artworks are highly evolved and celebrated worldwide. Enjoy your participation of her book adventure.